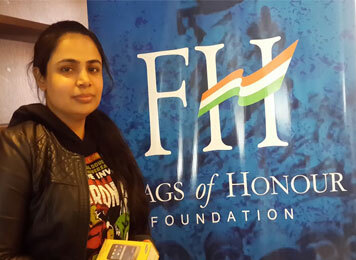 The Flags of Honour Foundation launched a 10 day Radio Campaign with an objective of associating and conveying the foundation’s objectives & mission to youth/citizens and veterans. With Radio partner - 93.5 RED FM Delhi, listeners were invited to send in their pledges on how they would serve the nation. 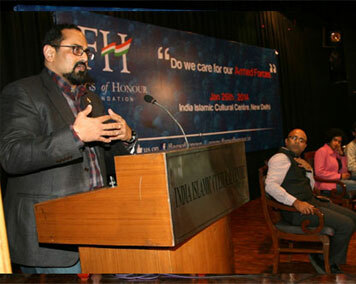 Flags of Honour Foundation organised a seminar on the topic “Do We Care for Our Armed Forces” at the India Islamic Cultural Centre, New Delhi. The panel speakers comprised of founder Rajeev Chandrasekhar, Maj Gen Satbir Singh of the Indian Ex Servicemen Movement, Ms Preeti Herman, Country Head Change.Org and Mr. Shivayan Raha of Seven Sisters: a Radio Show organizer based in Assam. The audience posed questions to the panellists. This followed by an open house where members of the audience expressed their opinion. Flags of Honour Foundation organised a commemorative event to mark Kargil Vijay Diwas in collaboration with the National Military Memorial Management Trust. 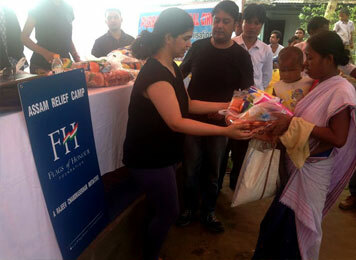 The Flags of Honour Foundation team hit the ground running at the affected Narayanpara and Ambari villages in Goalpara district, where they distributed essential relief material to children. Our special effort was to help girls from over 200 homes who have been facing poor sanitation facilities and malnutrition. 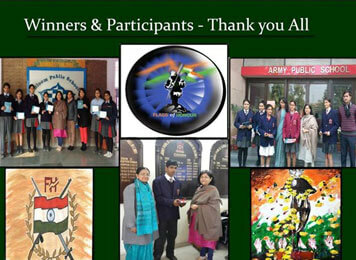 Flags of Honour Foundation invited young minds from select schools in Delhi/NCR to bring out their fearless creativity and celebrate the spirit of valour and selflessness through ‘Soldier On My Chest’, a badge designing contest .The contest saw an overwhelming number of entries. 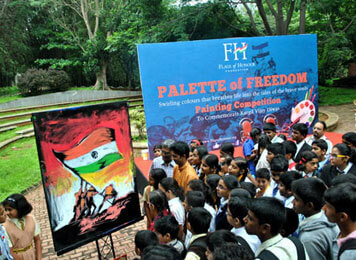 In order to remember the sacrifices and honouring these often forgotten heroes and to instil a sense of responsibility, civic pride and respect for the armed forces of our country in the future generation, the Flags of Honour Foundation organised a painting competition, on the 19th of July, 2013 at the Bal Bhavan, Cubbon Park. Aptly called Platelet of Freedom, the competition will see over 100 students ranging from Grade 4 – Grade 12 etching onto a canvas and swirling colours that breathe life into the tales of the brave souls. The competition was judged by a panel of judges from the art and armed forced background. A special feature of the painting competition was a performance by ace artist Vilas Naik, finalist of India’s Got Talent Reality show on Colors TV. The panel of jury consisted of celebrated citizen from the art and armed forces background. To commemorate Kargil Vijay Diwas, Flags of Honour Foundation presented , a Dance Recital titled ‘Krishna’ by Shobana, the famed Actress and Danseuse. The dance drama revolved around the life of lord Krishna, the highlight being the parallel drawn between Krishna and the armed forces of our country. 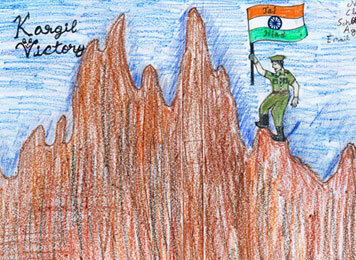 A massive tricolour was hoisted at Kargil war memorial. 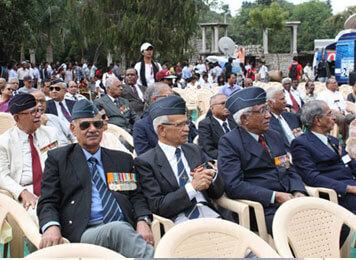 The Foundation Stone of National Military Memorial, Bengaluru was also laid. 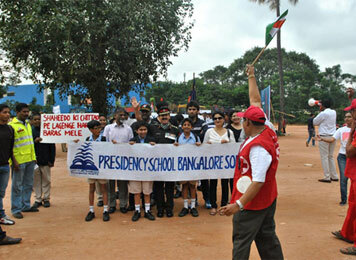 A walkathon was organized by Flags of honor in the memory of our Kargil Heroes on Thursday, July 26, 2012 at 8:30am at Queen's Statue, M.G.Road, Bangalore. Enthusiastic students poured in their creativity for the painting competition that was held by Flags of Honour Foundation. Over 100 entries were received across 150 schools. 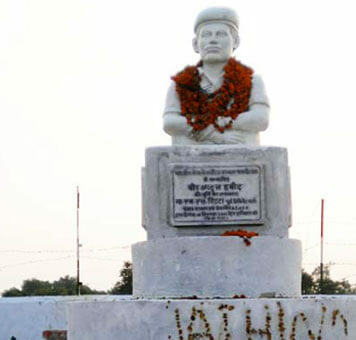 The Memorial built to honour the bravery and martyrdom of Shaheed Abdul Hameed, Param Vir Chakra, was in state of neglect with broken walls, battered lawns, bruised statue reflecting the disdain and disrespect towards the Armed Forces personnel and particularly towards Shaheed Abdul Hameed, one of India’s bravest soldiers. Taking note of the Memorial being in bad shape and in the state of neglect,The Flags of Honour Foundation decided to undertake all works to repair and renovate the Memorial and bring it back to original glory ahead of September 10th – the birth anniversary of Shaheed Abdul Hameed. Rasoolan Bibi, widow of Shaheed Abdul Hameed PVC, said, “We are grateful to Flags of Honour Foundation for coming forward and extending support to renovate the memorial”. A Press Conference was held on 11 Apr 2010 at Sainika Smaraka Site attended by hundreds of Ex-servicemen to explain the importance of the Sainika Smaraka, since the local citizens were against the construction of the Smaraka at the site, resorting to litigation. 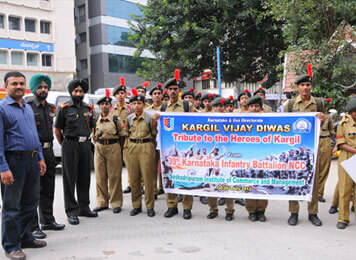 Kargil Diwas was observed on 25 July 2010 and was attended by over a thousand serving and retired officers and families, School Children, NCC cadets and prominent Citizens. The Chief Minister of Karnataka paid homage to the Kargil Martyrs by placing a wreath. Other prominent persons were Shri Anantha Kumar Honourable MP, Shri Rajeev Chandrasekhar, Honourable Member of Rajya Sabha and Capt. Ganesh Karnik, Honourable MLC. 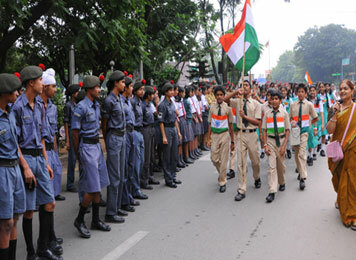 Homage to martyrs was paid on 63rd Independence Day celebrations on 15 Aug 2010 at the Rashtriya Sainika Smaraka site. Over five hundred ESM, NCC cadets, School Children and prominent citizens including Shri DB Chandre Gowda, Honourable MP, Shri Roshan Baig, Honourable MLA, Capt Ganesh Karnik, Honourable MLC and Shri Nataraj, the Honourable Mayor of Bangalore. 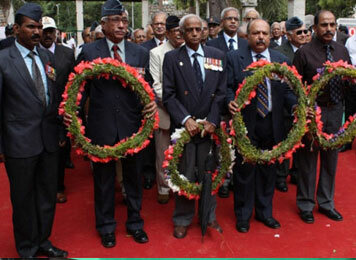 The Vijay Diwas Commemoration Day Function on 16 Dec 2010 was observed by paying homage to the martyrs & laying wreaths. Over 2000 people attended the function including serving and retired officers, JCOs and ORs and families from the Army, Navy and Air Force, NCC Cadets, School Children and other prominent citizens including Honourable Lokayukta Justice N Santhosh Hegde, Honourable Ministers Dr VS Acharya, Shri S Suresh Kumar and Shri Mumtaj Ali Khan, the Honourable MLC Shri Ganesh Karnik, and Shri Ramachandra Gowda, Dy Chairman, Planning Commission, Govt of Karnataka etc. Two families of martyrs, one from Indian Army and other from BSF, were honoured by presenting a Cheque of Rs 100,000/- each. 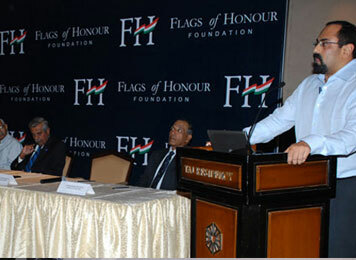 The Flags of Honour Foundation was launched by Member of Parliament Rajeev Chandrasekhar on the 10th Anniversary of Kargil Vijay Divas. Many dignitaries attended the function to extend their support to the Flags of Honour Foundations’ efforts to serve and support families of the martyrs of the Military, Paramilitary and the Police Forces of India.